We can’t help it. At Spike’s Trophies, we’re already dreaming about making custom engraved plaques for Phillies fans at the end of October to commemorate a World Series championship. Side note: remember us if it gets to that point. We can come up with a beautiful display-worthy design to preserve your favorite memories, including framing game programs, tickets, and photos. Of course, we’re getting way ahead of ourselves. But after watching the Phillies’ dominant Opening Day win over the Braves, seeing newly-acquired, big-money free agent stud Bryce Harper dig into the batter’s box wearing customized Phanatic-inspired cleats and countless fans in the sold-out stands getting up to cheer the team wearing No. 3 jerseys, we’ve caught an overwhelming case of Phillies Phever. Whether or not the Phillies reach the World Series this year, it’s going to be a whole lot of fun watching this team – and Bryce Harper is only a part of it. He joins a team with bona fide stars in Rhys Hoskins, Andrew McCutchen, J.T. Realmuto, and Aaron Nola. Four of those five appeared on the cover of Sports Illustrated’s Major League Baseball preview edition, and worrying about “The SI jinx” seems silly when you look around baseball and compare the Phillies’ level of talent with other teams. The fact is, the Phillies have just as good a chance as any team in the National League of playing in the Fall Classic. Sure, the Nationals have been picked to win the NL East, but predictions mean about as much as magazine jinxes, in our opinion. Here are three things that need to happen for Philly fans to attend October games at Citizens Bank Park. Nola is an ace and an All-Star, and you have to expect him to perform as such. Jake Arrieta is getting up there in years, but has shown flashes of brilliance over the last four years, and nobody in the game works harder. The wild card for the Phillies is Nick Pivetta, who’s getting a lot of press heading into the season. If he can have the breakout year some people think he will, that will be a huge boost for the Phillies. They might not be able to go toe-to-toe with the top of the Nationals’ rotation in terms of cache, but they’ll hold their own. With all the emphasis on the beefed-up lineup, people seem to have forgotten how bad the Phillies were on defense in 2018. They were the worst in the majors. No combination of sluggers will make up for 123 team errors when playoff time rolls around. The addition of Realmuto at catcher will make a significant impact, and Jean Segura is an improvement at shortstop. Moving McCutchen to left field allows Hoskins – who was out of place in the outfield – to play first base, where he’s comfortable. There’s no reason to think the Phillies will be booting the ball nearly as badly as they did last year. They simply can’t, if they’re going to compete with the Nationals, Dodgers, and the logjam of good teams in the NL Central. Much ado has been made about Harper’s debut, and how he got booed, but the reality is: The Phillies are good, even without him. That said, it’s obviously important for your 330-million-dollar man to do what he’s supposed to do: hit lots of home runs. Harper is here for the long haul, and he has embraced Philadelphia, but the only way he’s really going to feel the Brotherly Love is if he launches the ball into the stratosphere at a rapid rate. If he treats the 2019 season like he did the 2018 Home Run Derby, the Phillies are golden. Spike’s Trophies isn’t just a big fan of the Phillies; the Phillies are fans of us, too! 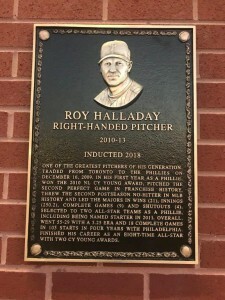 The team chooses to trust Spike’s with its Phillies Hall of Fame bronze cast plaques for legends like Roy Halladay (see photo at left) that hang proudly at Citizen’s Bank Park. Spike’s Trophies wishes you a happy baseball season and hopes it ends with the biggest trophy in all of baseball. Don’t forget to call us anytime for custom plaque engraving, whether it’s for an award a gift or a keepsake. Until next time, go Phillies!